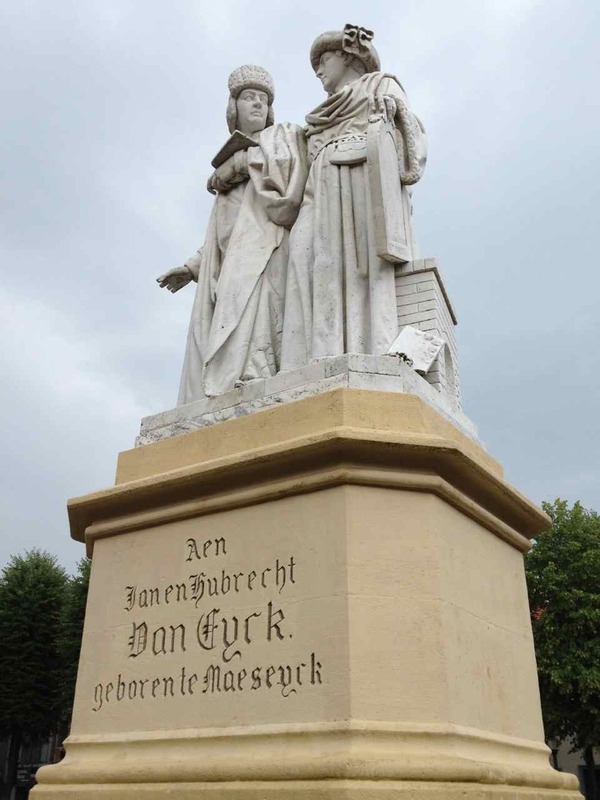 In the middle of Maaseik’s main square stands a large statue of two men wearing elegant medieval clothes. These are the brothers Van Eyck, Jan and Hubert, the fifteenth-century painters who are the city’s most honored sons. The two stand side by side, Hubert noticeably older than his more famous brother, while Jan is recognizable from the chaperon he wears in a self-portrait (now in the National Gallery in London). A hundred and fifty years ago, the spot where the statue now stands was occupied by a large oak tree, the symbol of a city whose name combines the Dutch word for oak with the name of the great river that flows past it. When it came time to erect the Van Eyck statue, there was a bitter dispute among Maaseik’s citizens over whether to keep the tree or remove it so that the statue could occupy the square’s central position. In a typically Belgian compromise, the tree was cut down and its wood used to make chairs for city hall. The people of Maaseik chose the Van Eyck brothers, rather than a tree, as their preferred mascot—and have never looked back.Today, Maaseik is enjoying a resurgence thanks in part to dedicated efforts to preserve and capitalize on its cultural patrimony. In Maaseik, you can take a guided walking tour “In the footsteps of the Van Eyck brothers”, drink a beer inspired by the Van Eycks’ greatest work, and see traces of the medieval city that Jan and Hubert knew. Any visit to Maaseik starts here on the Markt, where the Van Eyck brothers look out over one of the prettiest squares in Flanders. In this case, the Markt really is a square, perfectly symmetrical and ringed by well-preserved and beautifully restored seventeenth- and eighteenth-century buildings. As with the Grote Markt in Brussels, which was rebuilt after being destroyed by the French in 1695, this architectural unity came about through disaster: A fire in 1684 destroyed a third of the city’s buildings, which were then quickly rebuilt in the prevailing “Maasland renaissance” style. The tourist information office is centrally located on the square in the former city hall. It’s a good place to plan your visit and to gather information about the area. On the same side of the square, housed in a pair of historic buildings at nos. 46 and 47, is the Regional Archaeological Museum. Although small, the museum houses artifacts ranging from prehistoric times up until the nineteenth century. The modern, informative exhibits provide a good overview of the region’s history. 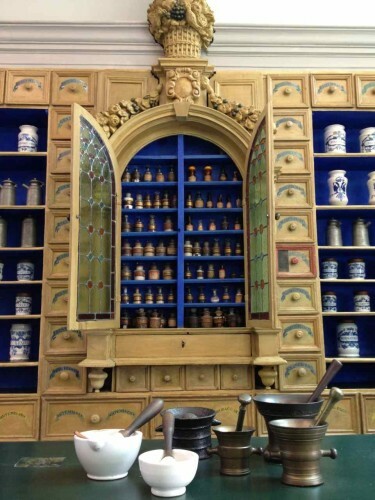 The museum also incorporates what the city proudly bills as “Belgium’s oldest private pharmacy,” an apothecary dating from the early 1700’s that was still in use until 1959. Recent conservation efforts have stripped away any architectural elements deemed not original, with unfortunate results. Instead of walking into a 250-year-old pharmacy, as one might expect, the visitor is instead confronted with isolated eighteenth-century apothecary furnishings in a plain, white room. Looking at a photograph of the premises as they appeared before the restoration, I found myself wishing they had left well enough alone. A tourist train departs from the Markt daily during July and August and on Sundays in May, June and September. On a recent weekday, I had the good fortune to enjoy a private tour as I happened to be the only passenger. Els, the young, enthusiastic guide, offered to sit next to me and give the tour in English. (The tour is normally given in Dutch). The route wends through the historic city center and also goes to Aldeneik, a neighboring village that pre-dates Maaseik. In the early eighth century, a powerful local nobleman named Adelhard founded an abbey in Aldeneik for his two daughters, Harlindis and Relindis. The sisters served as the first two abbesses and helped the Anglo-Saxon missionary-saints Willibrord and Boniface spread Christianity in the region. The name “Aldeneik” means Old Oak, and was the name given to the original settlement once a new town was founded in the thirteenth century, closer to the Meuse and therefore called “Maaseik”. Thanks to Harlindis and Relindis, Maaseik boasts some rare and historically important artifacts from the early middle ages, including an illuminated Gospel book from the eighth century, the oldest such manuscript in the Benelux. It most likely came from Echternach, the abbey that Willibrord founded in present-day Luxemburg. The church treasury of Saint Catherine’s also contains the oldest surviving Anglo-Saxon textile fragments in the world, preserved for centuries as pieces of a reliquary cloth. Despite its long and rich history, Maaseik is a living city offering plenty of modern diversions. The Markt is ringed by restaurants and cafés with copious outdoor seating. At café De Beurs, you can try the “Jan Van Eyck Tripel,” a beer developed last year at the request of the city. 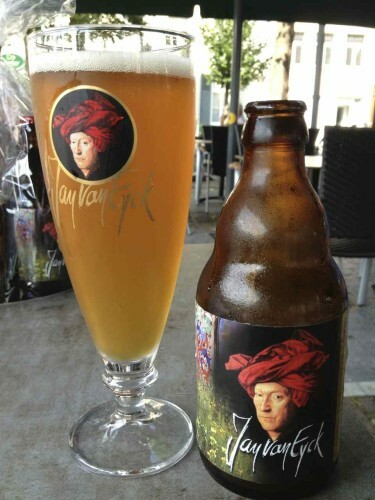 Served in a glass bearing the likeness of the painter, the brew is flavored with herbs depicted in the Van Eyck brothers’ greatest work, The Adoration of the Mystic Lamb, also known as the Ghent Altarpiece. Just off the Markt, the restaurant De Soeten Naam Jesus (“Sweet Name of Jesus”) takes its name from the building it occupies, an eighteenth-century canon house. Diners sit in the former cellar under vaulted brick ceilings. The specialty here is barbecued ribs, served on a wooden plank with salad and a baked potato. If the weather is good, head to brasserie De Kloostertuin and sit in the peaceful garden, tucked away in the inner courtyard. The streets around the Markt are perfect for strolling and shopping. 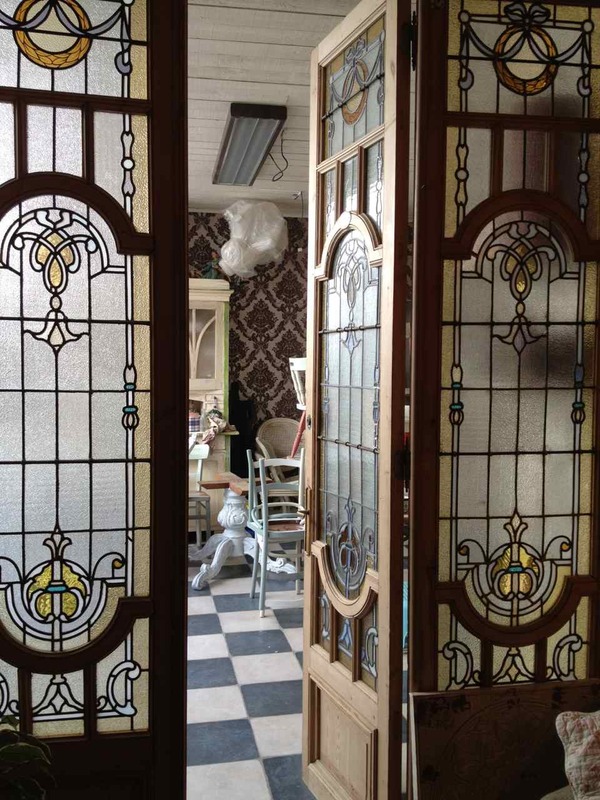 One of the most delightful discoveries I made was the antique and home décor store Barbotine. Proprietor Petra Jeurissen not only sells beautiful handicrafts, home furnishings and gifts, but runs a furniture-refinishing studio in the back of the store. Most of the vintage pieces for sale in the shop were refinished by her. She also teaches workshops on painting techniques. At the end of a day of sightseeing, history and shopping in Maaseik, you’ll certainly be in need of refreshment. Café De Vagant, tucked away on a side street near Saint Catherine’s Church, is just the place to enjoy a drink and rub elbows with the locals. The interior of the bar is all dark wood, exposed brick and vintage tile, and the ceiling is decorated with scores of little holy water fonts. Given the somewhat kitschy interior, the back patio comes as a surprise, filled as it is with all manner of tropical and flowering plants. 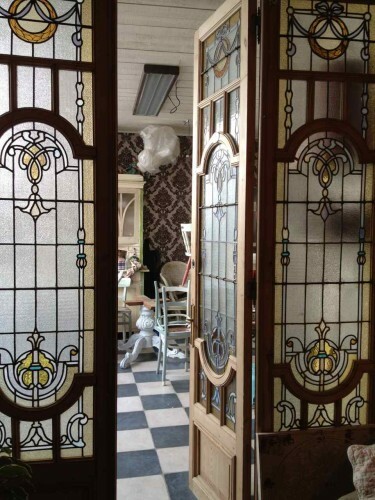 If you plan to spend the night in Maaseik, consider booking a room at the enchanting Bed & Breakfast Het Agnetenklooster. Hostess Patricia Indekeu has transformed her family home, part of a former convent, into a luxurious and stylish retreat. Two suites on the ground floor have the feel of a private country house, whereas the three attic rooms combine contemporary furnishings with wooden floors and exposed wood beams. The house and its gardens are hidden behind a wall, giving it an air of exclusivity in the middle of the city. Maaseik makes an ideal base for hiking or cycling in the surrounding area. The new Maasvallei Rivierpark encompasses several municipalities along the Meuse river and contains many hiking and cycling routes. Maaseik-Aldeneik is one of six starting points for hiking in the park; maps featuring both nature walks and cultural walks are available at the tourist information office. Maaseik, Maasland, museums, shopping. Bookmark.